Training: Dr. Ali earned both her undergraduate and her medical degrees from the Brown University Medical School, where she was awarded multiple honors and awards. She completed her residency in Ophthalmology at the New York University/Manhattan Eye, Ear and Throat Hospital Department of Ophthalmology, where she was chosen to serve as Executive Chief Resident in her senior year. 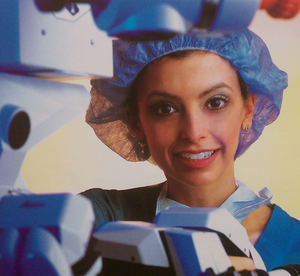 She then completed fellowship training in Laser and Cataract surgery at Manhattan Eye, Ear and Throat Hospital. Experience: Dr. Ali served as the Residency Program Director in Ophthalmology at Manhattan Eye, Ear and Throat Hospital as well as an Assistant Clinical Professor at NYU School of Medicine. She has taught courses in laser cataract surgery at the American Academy of Ophthalmology and served as a panelist judging papers for the American Society of Cataract and Refractive Surgeons. She has published numerous articles and book chapters on lasers and cataract surgery. Dr. Ali was featured on the television program BusinessWeek performing Lasik surgery. Dr. Ali is board certified in Ophthalmology and is a member of numerous professional societies, including the American Academy of Ophthalmology, American Society of Cataract and Refractive Surgeons, the American Medical Association, and the New England Ophthalmology society.